i make things and i bake things. Today was a beautiful 75°F and sunny. I couldn’t wait to spend my Saturday outside in the park. 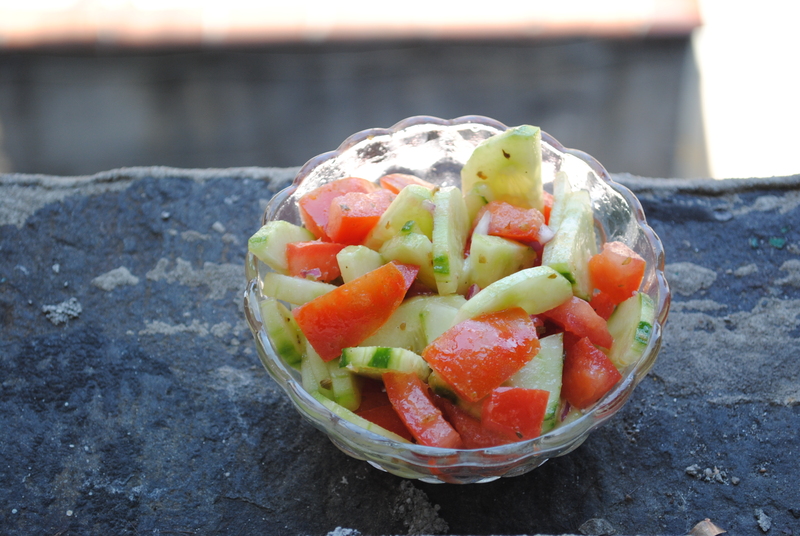 I knew I’d get hungry so I threw together this delicious cucumber tomato salad and hit the park. The park eventually became uninviting, as it was some sort of organized dance parade that sounded like Electric Zoo, but it was relaxing long enough to enjoy my lunch. 1. Wash and cut cucumber in half lengthwise, then into slices and fold into a paper towel to absorb excess water. 2. Wash and chop tomatoes into bite size pieces. 3. Cut the onion and add them into a bowl with the cucumber and tomato. 4. Drizzle with remaining ingredients and toss. Serve with bread for dipping. *For a heartier meal add red or white beans or peppers. This past summer I spent about two months in Brazil. I stayed with my brother and his family is Rio, and while I was there I met wonderful people, new friends, went to beautiful places and picked up a little Portuguese. The slight differences in the brazilian culture compared to the American, is one to appreciate only by being immersed in it. Though on occasion I regret not visiting Cristo, I enjoyed going where the locals went and doing what the locals did. But I did go hanging gliding in São Conrado! One part of Brazil that one can not escape experiencing, tourist or not, is the pão de queijo. It is as easy to find as it is to find pizza in NYC, it is everywhere; and it is delicious too. There are moments I wish I was back in Rio, but knowing I can make my own pão de queijo, I can stay in the US a little longer. The only difference between mine and ones in Brazil is the type of cheese. In Brazil they use a cheese called “queijo minas” which I have not found in the NYC. Parmesan seems to be the next best thing and works just as well. The Brazilian holiday Carnaval was recently celebrated last weekend and I couldn’t help but find a way to celebrate myself. I could have gone out dressed up in sparkles and feathers, but instead, I made pão de queijo and listened to Seu Jorge on Pandora Radio. 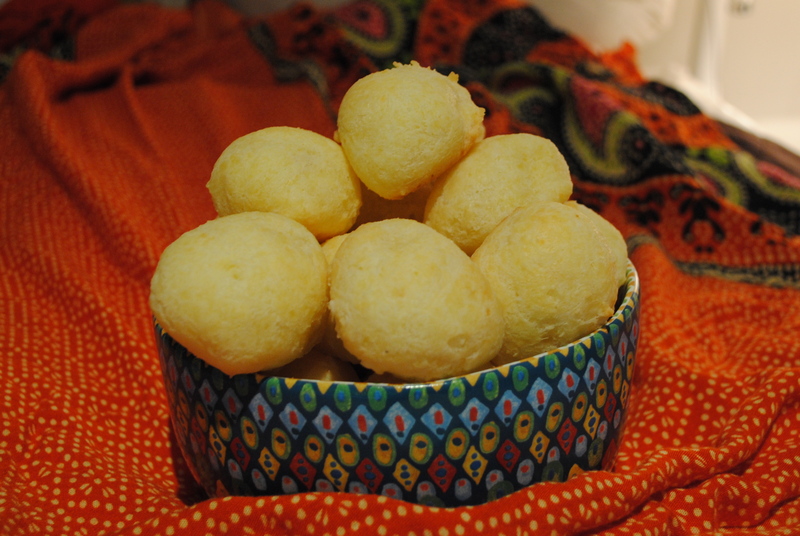 As soon as the pão de queijo came out of the oven, my friends Matt and Joe called to say they were on their way over. Thank goodness for that because I wasn’t going to eat 30 all by myself! The boys came over with milk and a box of fruit loops, but gladly put it on hold to eat some pão de queijo. These little balls of goodness are great for feeding some friends or having as a snack. You can shape the dough into balls, freeze them and cook a few at a time to snack on. Step 1: In a saucepan melt butter, then add water and milk and bring to a boil. Step 2: Remove the pan from the heat and slowly add the tapioca statch while stirring with a wooden spoon. Step 3: Let the mixture cool for 10 minutes. Then add the eggs and cheese. Knead the mixture for about 6 minutes, or until it is (mostly) smooth. Step 4: Grease a cookie sheet then using a tablespoon, scoop the dough into a ball and place it on the cookie. Cook for 20 minutes or until the the outside is crispy. After a week of holiday festivities and rural suburbia, it feels good to be back in New York City. I didn’t have much food to make for dinner, but I grabbed what I had and made something delicious. I’m really excited about this recipe because I’m always in need of something that is good when served cold. I would normally say to omit an ingredient or two if you want, but in this recipe it is a good idea to add in everything. The snap peas add and little sweetness and crunch, as do the hazelnuts. 1. Preheat your oven to 450°. 2. Dice the bell pepper and onion. 3. Put the quinoa, red wine, water, onions, bell peppers, salt and oil into a rice cooker. 4. While the quinoa is cooking, put the hazelnuts in the oven for 10 minutes. 5. Cut the snap peas. 6. When the hazelnuts are done cooking, let cool, then crack open and break the nuts into pieces. 7. 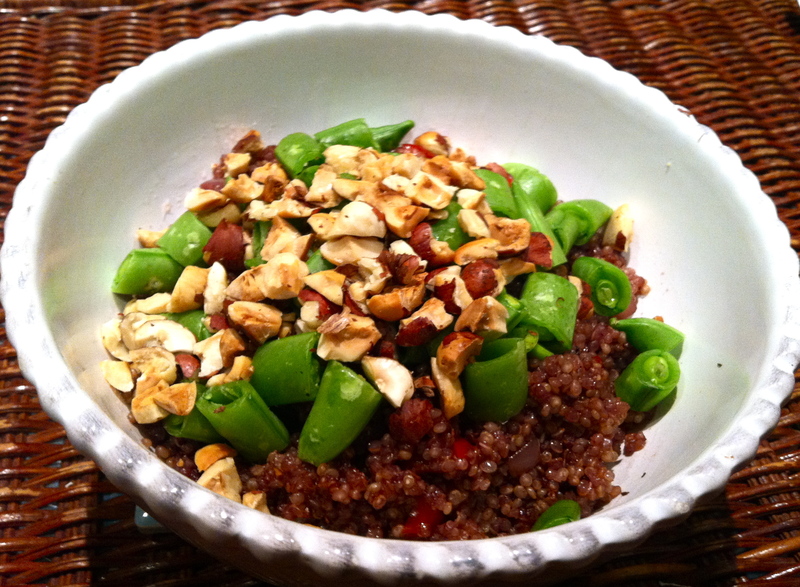 When quinoa is done cooking, add in the tablespoon of oil, and mix in the snap peas and hazelnuts. Chill for 10 minutes.